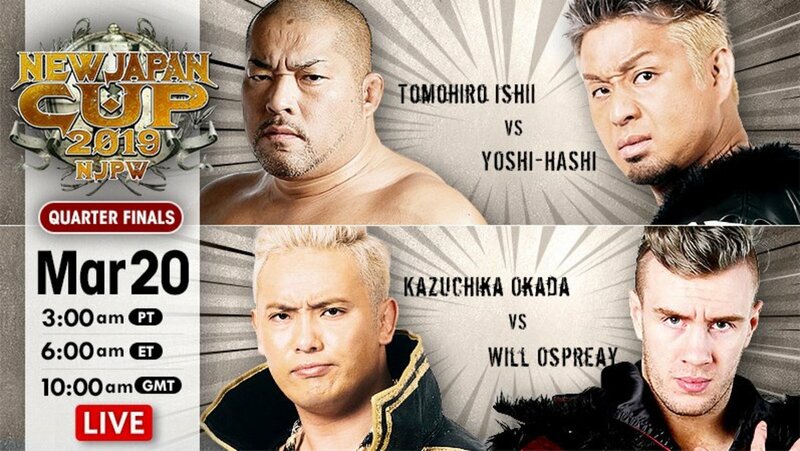 The quarterfinal round of the 2019 New Japan Cup kicked off today in Shizuoka, with two stellar tournament matches on top. The undercard on the show felt like filler. With Kazuchika Okada and Will Ospreay on top, nothing underneath was likely to steal the show anyway. And so, the opening tag matches provided little in the way of excitement. Only one undercard tag bout cracked the 10-minute mark, and the show moved at a brisk pace. Tomohiro Ishii and YOSHI-HASHI delivered in the semi-main position, while the main event was a showcase for two of the 10 best wrestlers on the planet. Business picked up a bit once Nagata tagged in, but this was not a strong opener. Nakanishi and Tenzan moved in slow motion. Nagata tapped out Tsuji with the Nagata Lock II. Bullet Club took control early on, as Jado used a kendo stick on Taguchi's glutes. Chase will challenge Juice for his IWGP United States Heavyweight title on Sunday, but he wanted no parts of the champ today. Chase repeatedly begged off, but Juice finally got his hands on him in the ring. Juice hit jabs and a cannonball. He teased Pulp Friction, but Jado provided a distraction, allowing Chase to hit a combination of strikes. Nicholls and HIKULEO got tags. Nicholls hit HIKULEO with the Mikey Bomb and picked up the win. Suzuki-gun, the rogues that they are, attacked before the opening bell. They then had a middling brawl. Makabe and Suzuki had an intense striking exchange, but aside from that, not much in the way of action here. The match broke down, with Taichi and Honma left the legal men in the ring. Taichi kicked Honma low, then used the Gedo Clutch for the pin. They continue to plant seeds for another singles encounter between Naito and Ibushi. Naito taunted Ibushi after the match, while Ibushi remained silent. During the match, Ibushi landed right on the top of his head while executing a backflip kick on Naito and Shingo. That was terrifying. Shingo gave Narita a good bit of offense, and Narita even kicked out of one Pumping Bomber, before eventually falling victim to a second. SANADA and Cabana gave a preview of their quarterfinal match tomorrow. They did some comedy, which worked well, and their serious wrestling was quite good. Cabana busted out a second rope moonsault. EVIL hit Darkness Falls on Henare, but Cabana broke up the pinfall. SANADA took Cabana out with a dropkick, and SANADA and EVIL hit the Magic Killer on Henare, leading to the pin. TAKA and Sabre dominated Umino early on. Tanahashi tagged in for a couple of signature spots, going head-to-head with Sabre. Sabre blocked one Dragon Screw, but Tanahashi managed to hit a second. Umino got a tag and hit an awesome missile dropkick, then kicked out of a PK from Sabre. Sabre sold tweaking his right knee, which is worth noting ahead of Tanahashi vs. Sabre tomorrow. Sabre used a Cobra Twist, then Orienteering with Napalm Death for the submission win over Umino. A very good match. Ishii is amazing. YOSHI-HASHI held up his end of the bargain, and he looked good in defeat. The story of the match was that, as members of the same CHAOS faction, these guys know each other well. Each had a counter for the other as they tried to trade holds at the outset. With that reaching a stalemate, Ishii looked to use his power advantage. YH had his left shoulder taped, and Ishii dumped him on that shoulder with a powerslam. YH stood up to a series of shoulder tackles and hit a headhunter. YH drew blood from Ishii's chest with a series of chops. They traded elbow strikes for a long time, and YH finally went down. Ishii hit an extended sequence of chops and punches in the corner, and he tore the tape of YH's shoulder. YH spit at Ishii, then slapped him in the face. YH dropped Ishii with a mid kick, then dropped him again with a lariat. YH hit a Liger Bomb for a two count. He slapped on the Butterfly Lock, then transitioned to a sleeper. YH hit a backstabber, then went back to the Butterfly Lock, but Ishii powered his way to a rope break. YH missed with a swanton bomb. Ishii hit a backdrop driver, but YH blocked the following lariat. They traded chops in the center of the ring. Ishii hit a jackknife powerbomb for a two count. YH ducked a first sliding lariat attempt, but Ishii connected on the second for a near fall. Ishii went for a brainbuster, but YH rolled him up for a two count. YH used another roll-up for a near fall, then hit a lariat, as they went into a double down. Ishii hit a lariat, and they exchanged headbutts. YH hit double knees for a near fall, then a fisherman buster for another two count. Ishii reversed a Karma attempt into a DDT. Ishii hit a headbutt, no-sold two thrust kicks, then hit a lariat for a near fall. Ishii then hit the vertical drop brainbuster for the victory. A great match. I could have used about five more minutes, as they really picked it up around the 15-minute mark. They left me wanting more, and they will meet again, I'm sure. They started slowly, exchanging headlocks and wristlocks. Okada broke cleanly on the ropes. Ospreay hit a monkey flip. He teased a dive, but hit his pose instead. Okada drew him to the floor, then sent him towards the barricade, but Ospreay leaped over the barrier. Ospreay came off the fence into an uppercut, and Okada took over. Okada hit a slingshot senton, a neckbreaker, then worked a chinlock, focusing his attack on Ospreay's neck. Okada placed Ospreay on the turnbuckles, then dropkicked him to the floor. Ospreay climbed back to the apron, and Okada hammered him with forearms. Ospreay pulled Okada to the floor with a rana, then hit a Sasuke Special. Back inside, Ospreay hit a handspring corkscrew kick. Okada countered with a flapjack, then hit an air raid crash for a two count. Okada hit a top rope elbow. He teased his Rainmaker pose, but Ospreay nailed him with an enzuigiri. Ospreay followed with Pip Pip Cheerio. Ospreay hit a series of kicks to the chest. He went for the Storm Breaker, but Okada hit an arm drag, then sent Ospreay into the corner with a kick. They traded strikes, and Okada won the exchange. Ospreay used a backslide, grabbed wrist control, then hit a lariat. Ospreay hit a second short arm lariat. He went for a Rainmaker, but Okada hit a dropkick. Okada missed with a second dropkick, and Ospreay hit a kick. Ospreay continued to pepper Okada with kicks, then hit an avalanche move off the ropes for a two count. Okada blocked an OsCutter and went for the Rainmaker, but Ospreay turned it into a standing Spanish Fly for a close near fall. Ospreay went to the top and hit a shooting star press, then another, and picked up another two count. Ospreay went for the OsCutter, but Okada hit a dropkick. Okada hit a tombstone, then went for the Rainmaker. Ospreay reversed into a Storm Breaker attempt, but Okada countered that with a spinning tombstone. Okada followed with the Rainmaker for the pin.